Casting attempt — Christina Made It. To cast something first you need an item to cast. My Grandma over the past few months has been collecting up pieces of broken jewellery and old silver for me to either restore, melt or turn into something new. One piece stood out in a bag she picked up from a charity shop; a set of brass lion heads. 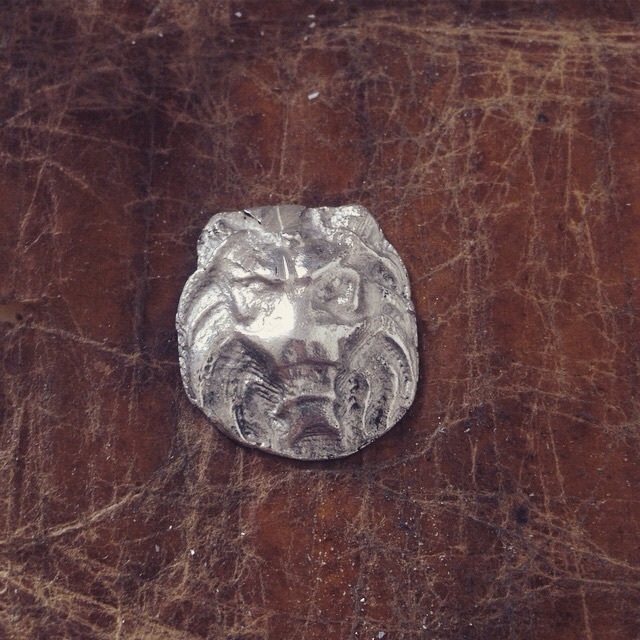 The brass lion head came as a pair, I have no idea what they are used for but it has two prongs at the back and as is was flat it was perfect for practicing casting. To cast you also need something to cast into. There are many different ways to cast metal; sand casting, lost wax casting for example. Most are carried out at a casters by professionals with professional equipment, but some you can do yourself. I had chosen cuttlefish bone casting (the kind you pick up from the pet shop for bird feed). It works well because it is both hard and soft at the same; soft to make the impression and hard for holding its shape at high temperatures. Its also a very cheap way of doing it, this bone was about 50p so if it all goes wrong I can just buy another one and re-melt the silver which can be melted over and over again. 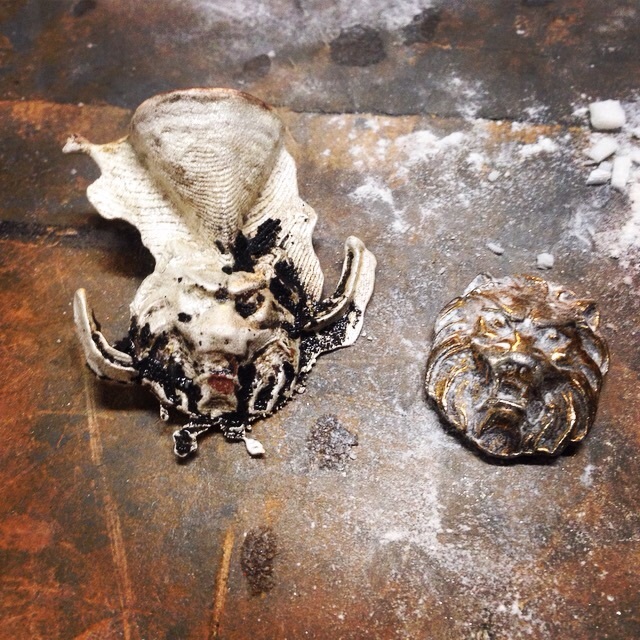 First I pressed the shape of the lion into the cuttlefish bone, adding air holes (using a scalpel) and a funnel at the top for the silver to channel down through. You can just abut make out the impression in the image below. Next the cuttlefish half is joined to a heat proof block which also has a funnel cut in. 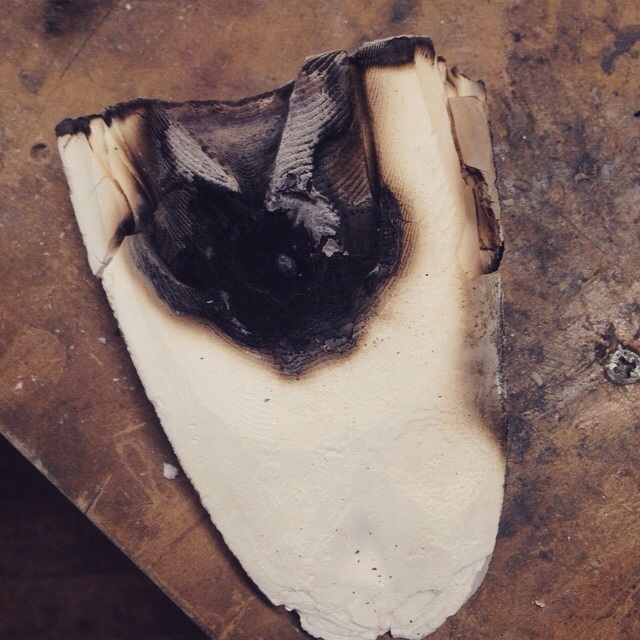 Normally you would use two halves of a cuttlefish bone but since the other side of the piece I was casting was flat I saved the other half of the cuttlefish bone to use for another time. The whole thing is then wrapped tightly with binding wire to hold it all in place. Into a crucible goes the silver to be melted with some borax powder. I used part of an old chain which one of my friends kindly donated. Then the scary part... melting the silver! It needed to be heated up to over 900 degrees, which if you were wondering, is very, very hot. The bricks around it are used to keep the heat contained. Holding the blow torch over the silver, it took about five minutes to melt it (felt like a lifetime!) the area surrounding gets ridiculously hot and the heat also reflects back towards you. As soon as it is hot enough and the silver is red hot with a liquid consistency it's ready to be poured, making sure you keep it heated as you pour. I panicked a bit as I poured it and manged to spill a few drops, but these can be collected up and melted down for another time so nothing is wasted. I used a brass brush to scrub off the charcoal left behind by the mould. To finish it the excess silver is cut off using a piercing saw and then files to smooth the edges. Once I had the shape ready it was just a case of polishing the piece until it was all nice and shiny.